Subscribe to the HAGC Newsletter! This is Hank. I posted this page to ask you to consider subscribing to my newsletter. 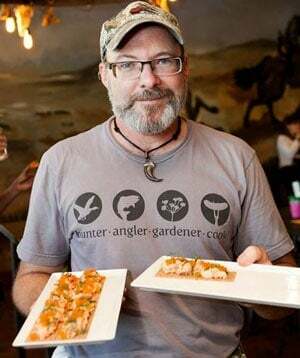 Each month I write a newsletter about my comings and goings, what I am foraging, fishing and hunting for — what’s in season all over the country — as well as my public events and special offers, like discounts on gear and advance notice about cooking classes or schools. It’s a chance for me to talk directly to you, without the filter of Instagram, Facebook (did you know that even if you “like” HAGC, Facebook doesn’t necessarily let you see what I post?) or the noise of Twitter. The newsletter will never replace the immediacy of live chatting on social media, which is why I will remain on Facebook, Twitter and Instagram. But if I have something important to announce, or if you want to contact me and be certain I’ll get it, the newsletter is the best way. So I hope you’ll sign up. I email my latest recipes and how-tos and essays, as well as one newsletter a month, and will only add other notes to you when and if there is something immediate and pressing to announce. I promise to not clog your email, and I promise not to give or sell your personal information to anyone else. Note, I will never give away or sell your email address to anyone, and neither will aWeber, our newsletter service. I hate spam as much as you do. If you decide you don’t want to receive email updates anymore, you can always unsubscribe; there is a link to do just that at the bottom of every newsletter. Is there any way to subscribe to a physical news letter? Beverly: No. Just via email. Sorry!